Associate Professor of Political Science, Debra Thompson delivers first lecture in the inaugural John Meisel Lecture Series in Contemporary Political Controversies at Queen’s University. Debra Thompson is one of the world’s leading scholars of the comparative politics of race, with many publications including the award winning book The Schematic State: Race, Transnationalism, and the Politics of the Census (Cambridge University Press, 2016). 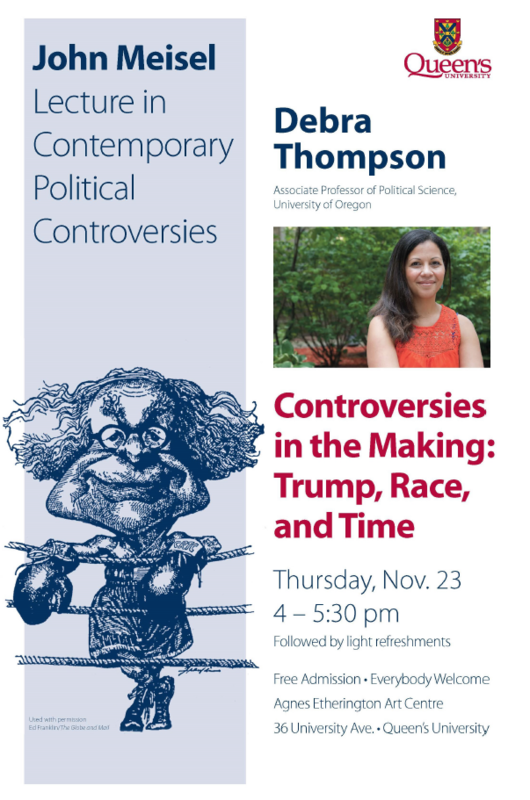 Hired as part of UO’s Black Studies cluster initiative, Thompson earned her PhD at the University of Toronto, held a postdoctoral fellowship at Harvard, and was most recently a member of the Department of African-American Studies at Northwestern University.